Easy to find experienced and cost-efficient professionals via outsourcing. It allows call sorting which gives more time in dealing server side and smaller side aspects. Higher Saving, as there is less overhead in outsourced IT support as compare to the financial downsides in supporting an in-house team and the equipment required. 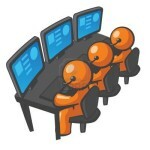 Outsourced IT support teams are able to provide round the clock support. While it may not seem like a logical-choice from the get-go, outsourcing IT support can actually do a lot to transform a business for the better. Outsourcing IT support and services can mean a huge reduction in operational costs for the business. When it comes to large Enterprises and non-IT organizations, hiring an in-house IT department is an additional expense. Manufacturing, Chemical, Power, Mining, Banking and Finance, etc. are the industries where businesses need IT Infrastructure, Networking, Data Centers, Disaster Recovery Sites, 24×7 Support and many more. To accomplish all these tasks you need a large IT Department/Staff and it is very expensive to hire a number of IT professionals to meet your needs. Enterprise IT outsourcing is the solution. You may get the exact same number of workers, but spend significantly less on their salaries. SolutionsHead Global Services offers a range of IT Outsourcing Services to the organisations worldwide. We presents an opportunity to find a team with a wide range of knowledge in different areas. IT is a very broad subject that may need a whole team of experts focusing on different things. By hiring us as a IT partner it is easy for the client organisations to specialize core tasks and have them accomplished more efficiently. Outsourcing IT support can open up doors for any business, and has therefore plenty of benefits. These are only a few advantages wherein outsourcing IT support can really make a difference, increasing not only a company’s revenue but also its efficiency and productivity. We were busy with giving a final touch to our website and polish our showroom and now we are ready to serve you a plate of industries’ best services and solutions right from IT consulting to Technology and Outsourcing. It’s been a long journey from concept to customer. We had to finish a lot of ground work and finally we’re here. So, now what to talk about on this special occasion ? Let’s come straight to the point. Industries are facing a common challenge nowadays. They want to focus more on their core expertise and strengths and want to achieve their business goals in most significant ways. They are also more concerned about the areas whether it is IT, Sales or Marketing. These are the fields which are backbone of any business. There are a lot of companies in the market those are good at their products or services, however, they feel difficulty to stand in modern business competitions. We, at SolutionsHead Global Services brings you a range of services and solutions including IT Consulting, Technology Services, and Sales and Business Process Outsourcing to outcome your challenges. Our sole purpose is to maximize your revenue, reduce your cost and become a valuable asset for your business. We want you to devote your maximum time on your core areas of expertise and leave rest of the work for us. We will do that for you. We are here to help you to increase your productivity day by day and work with you as a partner in various areas like IT, Sales and Technology. We assure you to lower the burden on your CIOs, CMOs, CSOs or CTOs shoulders. We are introducing award winning software solutions, Industry Automation Solutions and Sales and Marketing Solutions which will not only help you to gain maximum output at minimal cost. Keep browsing for more details in coming days !!! !